Spring is the perfect time start thinking about installing a new air conditioning system in your Columbus, OH home. Whether your AC is old, requires frequent repairs, or perhaps just simply can’t keep up with your cooling needs, a new AC can be a huge improvement. There’s no better feeling than knowing that you’re securing the future of your comfort, rather than propping up an obsolete system. But there is a staggering array of options on the market today, and it’s important to ensure that your AC is professionally installed. We’ve compiled a list of some things you may want to consider in consultation with your local technician. 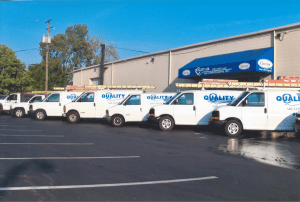 For Columbus, OH air conditioning installation service, call the experts at Quality Air Heating and Air Conditioning today! Ducts or no ducts? If you have grown tired of the ductwork in your home, or if you used to have room air conditioners, then you may like to know that ductless mini split air conditioning is available. Of the many benefits that ductless systems have to offer, their high energy efficiency is unparalleled. Because ductwork can sometimes have energy loss problems, ductless systems tend to use much less energy than their conventional counterparts do. Size: Above all, make sure that your pro installation includes a professional load calculation so that your AC is sized properly. If your AC is too large or too small, then it can lead to significant faults in cooling performance and efficiency. It can also lead to premature replacement and short cycling. Indoor air quality: There are many indoor air quality devices that are available to be integrated into your new air conditioning system, including UV germicidal lights, humidifiers, dehumidifiers, and air filtration, purification, and cleaning. In short, your new AC installation presents an opportunity to ensure that the air inside your home is not only crisp and cool, but also free of contaminants. We hope this helps you make your new AC a success. For more information about your options, call the Columbus, OH air conditioning installation experts at Quality Air Heating and Air Conditioning today!